WHO’S YOUR DADDY ?The Mayor of ?Whoville tries to parent a sulky Emo kid in this ?animated version ?of the classic. This week saw the release of a violent film about the impending end of the human race (Doomsday) and another one about man’s pitiless inhumanity to man (Funny Games). 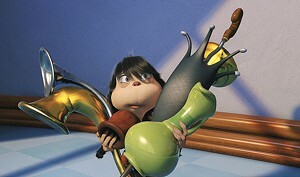 Then there’s Horton Hears a Who!, the G-rated kids’ animation that somehow manages to be about both those things. OK, so it’s a pretty silly story. But take away the doggerel rhymes and whimsical illustrations, and this tale of macrocosm versus microcosm would be terrifying. Like many great children’s authors, Theodor Geisel knew how to walk the thin line between absurdity and dread. Replace the rage of the Sour Kangaroo with an asteroid aimed at our own “speck” in the universe, and you have the plot of Armageddon. But, once you get past its flip protagonist and the lame topical jokes about MySpace and home-schooling, this Horton, directed by Jimmy Hayward and Steve Martino with computer animation from Blue Sky Studios, is pretty good. It looks like it takes place in Seuss’ world: Horton’s jungle is full of green hillocks slanting at impossibly acute angles, while Whoville is an absurdist carnival. The two worlds are visually distinct, yet both teem with detail. The candy-colored hair on the Whos moves in the wind, giving the images an illusion of texture, and some of the backgrounds — like the sunset vista that frames the film’s climax — have an almost painterly beauty. When Horton has a fantasy in which he turns into a karate-chopping anime elephant, adults might be reminded of the surreal shifts to animation in Kill Bill. Needless to say, transforming a picture book into a feature film involves adding a lot of original material, from Horton’s friend Morton the Mouse to the Mayor of Whoville’s domestic life. Though the comedy is hit-or-miss, the film generally stays true to the shape of the story — and its humanist message. One ill-advised change involves Jojo, the “smallest Who” whose timely action saves Whoville. In the book, we don’t meet him till the climactic scene, when he’s discovered in his room, oblivious to impending doom, and his anonymity underscores the message that anyone can make a difference. In the film, Jojo is the Mayor’s teenage son, trying to earn Dad’s respect, and his hair clearly marks him as a member of the Emo Tribe. A funny reference, but not one for the ages. Horton isn’t “just” kid’s stuff, whether you take it as an anti-abortion statement — as some activists have, to the distress of Geisel’s widow — or a powerful affirmation of human rights, or a reminder of how very small we all are in the cosmos. This adaptation is easy on the eyes, but it also gives the mind something to chew on.